Table Rock Lake consists of two main sections; the Conservation Pool and the Flood Control Pool. The Conservation Pool has a surface area of approximately 43,100 acres, 745 miles of shoreline, and a lake elevation above mean sea level of 915 feet. The Flood Control Pool has a surface area of approximately 52,300 acres, 857 miles of shoreline, and a lake elevation above mean sea level of 931 feet. A large Dam impounds the Lake and is used for the generation of hydroelectric power. Table Rock Lake offers a wide variety of recreational activities including hiking, sightseeing, hunting, skin diving, fishing, swimming, boating, water skiing and many others. The lake offers excellent fresh water fishing for warm water species such as Largemouth Bass, Spotted Bass, White Bass, Crappie, Channel Cat, Bluegill and other panfish. Best times to catch Largemouth Bass is in the morning and evening. Crankbaits and plastic worms fished in 15-20 feet of water along steep drop-offs produce well. Night fishing can produce some larger fish. Main night action occurs around 1 AM in about 8-15 feet of water on lizards, grubs and 10" worms. 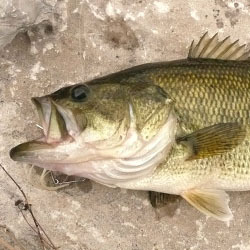 Spotted bass can be caught along points in 35-60 feet of water with a jig, grub or spoon. Underwater humps next to deeper water are also good areas to try. Nightcrawlers, minnows, crawdads or shad fished straight down in the same areas are excellent baits for days when the bite is slow. 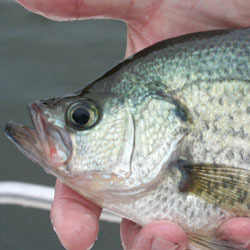 Crappie can be caught at night with minnows around docks and brush piles. Bluegill are often caught in mid summer with small crankbaits, spinners, little poppers and flies in 1-5 feet of water. A cricket under a bobber can be deadly for big gills. Fishing early morning is best. Fishing with white buzz baits, pop-Rs, rattle traps, and rooster tail spinners in areas with surface activity can be hot. 4 lb white bass are common in Table Rock Lake so be prepared for some battles. Many catfish are caught still fishing at night with small sunfish or minnows. This map covers the Eastern side of Table Rock Lake from Table Rock Dam to the James River. Table Rock is one of the nation's premier fisheries with largemouth, smallmouth and spotted bass receiving significant attention from anglers. Crappie is also very popular with white crappie dominating the population. Paddlefish and catfish are other frequently caught gamefish. This Hot Spot Map details the Western portion of Table Rock Lake from the mouth of the James River to Beaver Dam. Table Rock offers plenty of bass action, with largemouth, smallmouth and spotted bass being the prime targets for many. There are also excellent opportunities for crappie, catfish and paddlefish. Each detailed map provides depth, contours, structure, boat ramps, and updated fishing information. 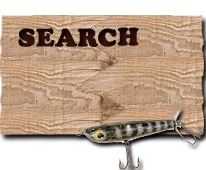 Table Rock Lake fishing maps also include lake info such as gamefish abundance, forage base, water clarity, weedline depth, bottom composition, complete latitude/longitude grid lines and dozens of GPS waypoints & coordinates.